What a great day to out diving, oily flat water, 17 degree water & 10m viz. We started our dive 90 minutes prior to Slack Water, this gives us just the right amount of current to complete the distance we need to cover and still the current is mild enough to allow us to do the job at hand. We had two teams of divers, diving 20 minutes apart & although we didn’t find the shell we were able to gather some good intel which will allow us to better maximise the tides when we next run a search. 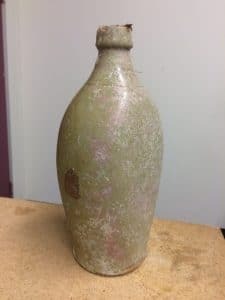 The area we are diving is well known by bottle collectors and our divers often find interesting bottles on the dive, none more impressive than this rippa ceramic bottle found by Ross!